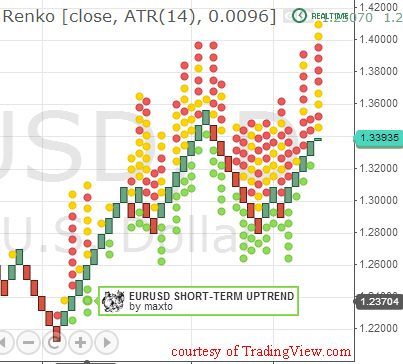 How to read a renko chart with trading ideas. First let me explain what it exactly is. It's basically a price chart that looks similar to the more frequently used candlestick chart. However, one of the first things you may notice is that they're 'candlesticks without the wicks' and are either filled (green) or hollow (red). Also, all of the bricks are exactly the same size. If it sounds Japanese to you, that's because it is! They're the same good folks who brought us candlestick charts. As you can see, it really shows the bull market that's going on right now (it also makes you wonder how long that's going to last). So in essence, if the price moves a lot higher (or lower) than the previous brick on the chart another brick appears. Green (or hollow) bricks are added if the price is increasing, red ones appear when the price is declining. It sounds very simple and that's because it is. It's important to understand the time frame of a renko chart, as you may have noticed there is a wider gap between August and September 2011 than there is between September and October of that year. That's because a new brick will only appear if there is a noticeable price spike or drop. This takes care of measuring the volatility on the chart. Brilliant! If you 'mouse-over' the green, orange or red circles, you can see trading ideas and suggestions by a vast online community. This is the renko chart for the EUR/USD at this time of writing. As you can see there's a lot of red and orange circles above the forming bullish brick, meaning there are many traders bearish on this currency pair. If you click on one of the circles you can see their interpretation of the chart. This is a great way to gather some trading ideas and shows you instantly if you're trading in a bull or a bear market. 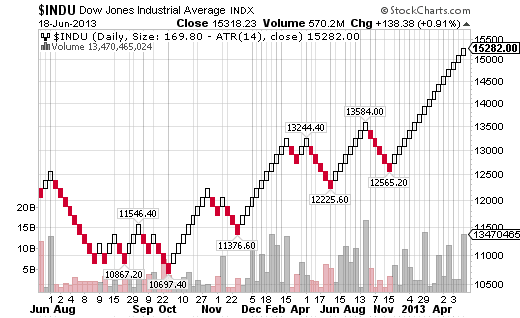 The best example is still the first chart of the Dow Jones shown above I think. It's quite apparent it's having a bull run, but again - keep in mind the time frame! Although this type of chart has been around for awhile, they became popular after Steve Nison's 'Beyond Candlesticks: New Japanese Charting Techniques Revealed (Wiley Finance) ' book. If you want to know more about charts and extensively study them, get this book which currently sells on Amazon.